I had this exact same issue with Helix Rack + Helix Control. Same firmware, same symptoms, same fix. It seemed to happen on both headphones and SPDIF output for me. I'm still having a problem with adding or changing blocks while the control and exp pedals are connected . if i try to add or change the model of a block while the control and my 2 expression pedals then the Helix rack will freeze and i have to turn it off and on again. Yesterday I noticed I was getting a dry signal mixed with the processed signal at all times for all presets. I don't know what caused it. I'm fairly certain I did not change any global settings, presets (100% sure) or any DAW settings (100% sure) prior to noticing this. Monitoring was done via the SPDIF output. Doing a global reset (5 & 6 footswitch method, leaving presets intact) seems to have fixed the problem. Tried reproducing it but can't. Not very helpful, I know, since I can't reproduce it, but thought I'd mention it nonetheless. 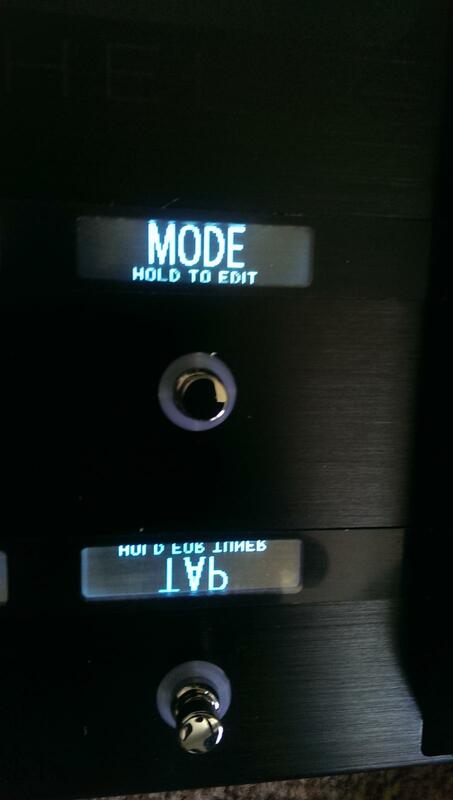 Did you set the tuner output to "Multi", and then restart at any point? If so, it could be the same issue myself and another user are having. As a workaround, switch to the tuner and back again. At least you don't have to do a global reset! Thank you. That must be what happened. It's reproducible. Your workaround works too. But it doesn't survive a reboot, so you have to remember to switch to the tuner every time you turn Helix on. Until they fix it, I'll just leave the tuner muted and not worry about it. since version 1.12 when I create the new patch, you can not route to the 2B path. Not sure if this was just an anomaly when I observed it, or widely reproducible: it seems the bucket brigade delay isn't responding to slower tap-tempos. Not ridiculously slow either, like 70bpm and slower. This is by design... The max delay time for the Bucket Brigade is 300ms, and when you tap in a tempo that would result in a longer delay time, the Helix gives you an actual delay time that would still be in sync with what you tapped, just a shorter note subdivision. Ben Adrian describes it in detail here on TGP. Hey all, I think I know what's going on. So, we figured that if a user was tapping a tempo, being in time was most important. If a tempo was tapped out of the range of the delay, an in tempo value inside the range of the delay would be substituted. A dotted eighth note at 70 BPM is equal to 642.75 ms. Maximum delay time for the Elephant Man delay is 500 ms. Since the tap is out of range, the tap tempo block will intelligently switch to a related and in-tempo. Iâ€™m guessing that it will halve the time, but I didn't write the DSP code for this feature, so I'm not 100% sure. In the above case a half time adjustment would give a result of 321ms, which is a dotted 16th. Thanks for the info! My admittedly quick google search didn't net anything. I do wish the manual went into more detail on specific effects blocks and their parameters. Most are obvious, but there are a number of settings here and there that aren't quite so obvious - along with some of the min/max constraints like in the Bucket Brigade. Thanks! This was the exact problem I had after updating to 1.12, have never had another issue since day 1 firmware. I found the preset causing the issue and did as you suggested, working great again! I added the link to the downloadable spreadsheet that assists you in finding the setlist,bank, and footswitch that corresponds to the number showing in the "rebuilding ..." message. If anyone is having random lockups while using the editor, or can't get the editor to start, the procedure described in the "Workaround:" part of my original post might be one potential fix to the problem. Since I've installed the helix driver, when I start Sonar (with the helix on) all my ASIO driver(mackie,motu,yamaha) desapear. I'm not able to reactivate the driver when the Helix is power ON. 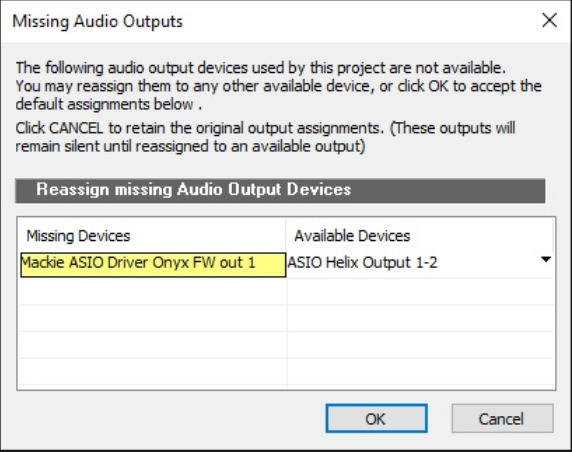 As soon I put the Helix OFF, all my other Asio driver are working back in SONAR. So if I want to record from the helix with another instrument plug in my Mackie mixer I have to unplug the usb cable. First time poster; This seems like the proper thread for my issue. I've got what might be called the black screen of death. Everything has been great for the couple of months I've had the Helix. There has been only one or two glitchy screens upon booting over this time. This morning I booted up for a session to arrive at a black screen and mostly blank scribble strips. Only the top row of assigned switches showing up (Trinity chorus and Looper fwiw). I figured it would be as easily fixable as the previous glitchy screens via a shutdown and reboot. No such luck. After four reboots it is still the same. Oddly, on one reboot the looper scribble went away, leaving the Trinity by itself, but it came back on the next reboot. I still get sound, but no physical controls are working. Capacitive touch or otherwise (even volume knob). So at least for the moment I'm getting the straight AC30 tone to get me by, but this is a huge bummer to the inspiration this morning. I digress. A few notes on my usage of the unit: It shipped with 1.01.2 software, and I have done no updates. Probably pretty silly of me. I've never even bothered with connecting it to my Mac. I just dove in and tweaked the amp presets to my desire. This is a large part of my dilemma. I would do the factory reset, but I don't really want to lose my tweaked patches. I assume there's some experience here for how I should proceed. All help and direction is greatly appreciated. I would love to get back to a working screen and my old patches to pick up where I left off. I believe that's all the pertinent information. Please help this poor uninformed soul. I strongly advise you contact Line 6 support first to make sure they can walk you though the correct way to find, download, & install the 1.01.2 apps/driver/etc. then access the Helix via your Mac. You can ask them if that will work. Digital Igloo would know if you may be able to try is to install the Line6 Updater from the archives if it is available and use that to backup your patches via the USB interface with the system up. Hopefully it would work like the "no screen" iPhone and still connect so you can backup your custom songs/presets/setlists before you try the F/W and App update. Hopefully DI will read this and reply or someone who has had this happen before. - After that you can't import IRs anymore until you restart the Editor. Thank you. I am hoping the same. You guys have been here in the trenches since before the unit came out, so I'm hoping to get some good eyes on the issue. I took your advice to action and created a ticket after some searching through other posts. Someone stated a hardware issue that scares me, but I am hopeful that I can at least save my work and move forward. Here's to hoping there is no cost in this issue. I have loved the unit, and it has spent its life on my studio floor. I can't imagine what went wrong physically with the device or why this issue would take so long to rear its head. Too many saves and edits on a long enough timeline? I've only had it since November-ish. I look forward to someone like DI responding. Otherwise I am waiting on a response to my support ticket. Just as an update. My issue is resolved with the help of Line6 Support. I ended up losing my work because the updater wasn't recognizing the Helix. I did the factory reset without even thinking that I hadn't (and still haven't) tried the Helix Editor. I feel like a fool for the unknown possibility I could have saved it, but such is the risk I took not updating all along the way. Interesting side effect is that all the patches seem to be a lot louder than they were before. It's kinda nice. Things are going to be a lot easier moving forward. Having put months into certain patches I know where to go a little better. I'm excited to have the unit back. There is a bug in the editor. It happens when you are assigning MIDI events to controllers. I always assign my output blocks to 1/4" and set Level to CC100 and Pan to CC101. When I highlight the output block in the editor and go to Controller Assign, all the values in the parameter screen change to their appropriate values on the sliders when I toggle between the Level and Pan with the exception of the MIDI CC number. The editor shows it as CC101 regardless of which of the two are active. This should change to the correct CC number for that parameter. However, I have found that if I use the FS10+FS11 when powering up "rebuild existing presets" feature it works fine until I modify, change, add, or remove any blocks or presets. I've shared my findings with CS and my findings have been constantly forwarded to QA over the past several days. Line 6 Support is very aware and very detailed so I try to be the same. I commend them for working with me as well as the other issues they are currently working on. I prefer to proceed with systematic fact finding so I can be something of an extension of support since at the end of the day that would be a great way to live in a great world. I strongly recommend using the support ticket link as well as this Bug Report thread in this forum. Objective: Have Screamer and noise gate (at input) toggle off and on with a single footswitch press. As well, I want the switch light and s strip showing as on or bright while both effects are on. Upon preset selection, both on. Good to go. Toggle the assigned foot switch to confirm functionality. I come back to the above patch to jam and notice that while the Screamer and noise gate (at input) are on with preset selection (all good), the light and scribble strip are dimmed. I toggle the foot switch and find that the behaviour of the noise gate has reversed itself as well. Gate off, Screamer on. So I go back in and fix it all. Same result. Come back to the patch and it's messed up. Also some more odd behaviour... If I press the assigned switch (with my hand, cap touch on) down very quickly, the controller assign info shows up on the screen (but not every time-appears random) and the patch acts as if I just touched it for a second and the Screamer (or which ever block I am testing) becomes the active block. I have redone the action on different footswitch assignments and different effects. I can get the block on / off - light / s strip functionality to save long term on one patch, but pressing quickly to toggle always highlights the block and randomly calls up the Controller assign. This only occurs when including the noise gate (at input) in a multiple block switching system. Cap touch on. FYI, when touching the foot switch to scroll through and highlight each block on the assigned switch, it does not include the noise gate (at input), only effect blocks. Why would depressing the switch quickly cause different behaviour from depressing the switch at normal speed? FYI, when programming, I just hit a switch with my hand quickly as it's, you know, faster. I want to maximize playtime. This happens when I either use cap touch or program manually. This does not happen when cap touch is off. I have not reset the Helix to factory and re-installed. If any of you reply to just keep cap touch off as a solution, please, go back to sleep. I've already made a band aid. This is odd behaviour! +1 to above first issue, same current firmware on Helix Rack. Came back to mighty switching preset with similar functions as Fulcrum above - all behaviour swapped; my 'channel switching' function switch is in fact dim, BUT the blocks and parameters are working the other way. In my case, the result was I came to my preset grinding away at a wicked high gain sound... but it's to start clean. Someone may have already posted on the this. But I didn't see anything. I have wasted many hours on this until I figured out what was happening. Hopefully this will have someone else some frustration. I have experienced this with gain and volume objects but I might effect other objects. -Enter in a min and max gain on a volume parameter. -select any other block (but not the volume block). -If you hit store at this point you min and max will be wiped out but you will not see the change until you leave the program and come back. -If you going into the volume block and look at the min and max it will then it seems to store the values. What is odd is that even if these parameters are at default I still get the asterisk indicating something changed. I would not think that would show up unless a parameter was really changed.Or maybe I missed something else. After about 10 minutes use the LED "scribble strip" above the TAP button corrupted. The lettering went upside down and back to front. I have attached a photo. Later, it just turned into a load of random spots. I am in the UK and bought a Helix from Germany because they weren't readily available in the UK, even though they were available elsewhere. Sent it back as a result of this fault because I have had problems with Line 6 LED displays before. I had a POD HD 500 and two lines of pixels went down just after the warranty expired. Didn't want to take a chance with this happening again. It's such a shame because the facilities this things provides are amazing but for over Â£1100 you want battleship build and no bugs, something you get with Roland gear (in my experience). 2016-04-05 11.45.36.jpgAfter about 10 minutes use the LED "scribble strip" above the TAP button corrupted. The lettering went upside down and back to front. I have attached a photo. Later, it just turned into a load of random spots. Well, when you mass produce items in the thousands, there's always going to be a few failures when it comes to these sorts of components. It's just unavoidable. I hope this doesn't put you off on the Helix altogether. As far as Boss/Roland, I used to work at a store that was a Roland/Boss dealer, and I can assure you they have to deal with issues just like any other manufacturer. Thanks Phil, I appreciate your comments about mass produced products and your experience of Roland/Boss. I have been very unlucky with Line 6 products and lucky with Roland/Boss. I can't help feeling that the chances of a failure with your products is high compared with others. I have used a lot of your products! I had hoped that the quality control on this product would be higher as the price is significantly higher than previous products, eg the HD 500X, which this doesn't seem to be much more than a step change up from (bearing in mind the previous product range improvements). Unfortunately, my experience is that this product is just the same as the others. I think you need to improve reliability and offer better customer service and warranty periods, with the opportunity to get a product repaired with less hassle to the purchaser, perhaps offering free postage for warranty faults and quick turnaround. If you want me to buy a Helix at Â£1150 I need to feel confident that if it goes wrong it will be easy to get it resolved quickly and that it will be reliable for longer. Well, first off, I'm not a Line 6 employee in any way, shape or form. I'm an expert user here on the forums, which was something Line 6 started a number of years ago. I do help Line 6 in beta testing, so I do occasionally get things free to test. The vast majority of Line 6 stuff I own I have bought with my own money, just like other users here. I understand your frustration in regards to having things not work or components fail. I think overall, the Helix is a step up from a build-quality and quality control perspective for Line 6. Of course, like I said, there will always be failures, and all the testing in the world won't catch components that fail after they've left the factory. The thing I've seen is that Line 6 has gone out its way to deal with these issues with the Helix. Over on The Gear Page forums, I've seen their Senior Director of Operations work personally with posters to get them replacement units in the few times it's come up. I don't think there's a whole lot more they can do in that area than what they're actually doing. It is always more difficult when dealing with users on different continents and in different countries, for sure. Thanks Phil. Apologies for assuming you work directly for Line 6. My comments stand and it would be nice if they listened to users with experience of their products. My impression of the Helix was generally good but that the sounds weren't a real step up from the HD500X. There was an improvement all round but not a 2-300% improvement that the price indicates. I think I figured out what the bug with the CustomTone download link is and it has nothing to do with the OS version or browser, at least not on Windows. I have two Line6 logins, one login has products registered to it and one does not. When I login with the one that has products registered, I do not get the grey screen with the "x" and I can download normally. When I use the login without a product registered, that is when the webpage goes wonky. So.. it looks like you need to have at least one product registered not to get the weird download behavior. This may impact your ability to comment your uploaded preset in CustomTone as well. Update: I have to revise my testing conclusions such that the CustomTone download issue appears to be a login issue. If it is OS or browser related as well it may be limited to how the login is interacting with the OS/browser only in Windows. Will have to wait to hear back to see if any Mac users are having the same issue. If i go from preset 1 to preset 2 in the Helix the mix settings that are saved per midi CC buttons on the PBC are not being reflected on the Helix. But if i press the preset button again on the PBC (in this example preset 2) then the mix settings are reflected. I have to be on the preset first and then press again to get the mix levels to reflect my programming. Am i doing something wrong or is this just the way the Line 6 Helix is setup? That's how I would expect it to behave, logically speaking. Using the rack without it is, imho, miserable. At least two Line 6ers are on record as saying they wished they could have packaged it so you CAN'T get the Rack without Control. Not only what it does now, but what new features are to come will be tightly integrated with Control. It will just frustrate you long-term. I already own the Helix Control and it would probably work ok if i didn't have other pedals being used in front of my amp. I don't want to have to tap dance. I like to be able to push one button and control everything. I also run a dual head setup and unless I am changing patches for every sound i don't think the Helix Control would be able to handle the channel switching of both heads. I am not sure how it is logical to think that i would have to push a preset button twice in order to reflect what is already showing on my controller but I do appreciate the response. You might want to take a look at this thread on using the CV output as a second amp controller output. It might enable you to control both heads simultaneously. Is this the correct place to report a bug? If not, apologies. I use a controller switch, the desired function happens, but then Helix opens the "controller assign" page. I press the home button to exit out of this screen but instead Helix takes me to the page showing the parameter for the controller. I hit the home button again and nothing happens. There's no easy way to exit out of that screen/function. Control clicking on a block doesn't allow it to be copy/pasted. This is listed as a feature in the release notes. Am I missing something?